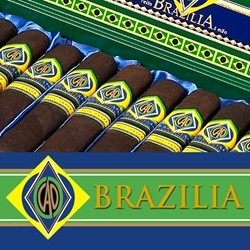 In 2001 CAO introduced their first dark leaf cigar, CAO Brazilia. These hand-rolled premium cigars are infused with top-quality Nicaraguan long-fillers and binders, bound together inside a dark wrapper leaf from the Bahia region of Brazil. Manufactured in the Carlos Toraño factory in Nicaragua, CAO Brazilia is a unique South American style blended cigar that produces deep aromas of nuts, cocoa and earth with each draw. The CAO Brazilia are hand-rolled premium cigars that make an excellent choice for any cigar connoisseur who loves a full-bodied yet smooth and balanced smoking experience. Smokers Discounts has made it easy and affordable to buy premium cigars online. A variety of sizes and flavors are listed below at our discount online cigar store. Each of these styles are in stock and available. Call us for more details!